A bit late, I know, I did actually make this back in January. Following on from my previous winning post about my kernowcraft wish list, I used my winning voucher to start me off on my birthstone jewellery venture. My first make was this stunning wire and glass bead crocheted necklace and earring set featuring Garnet drops. which is the birthstone for January. This set is currently available from Gallery at 12 in Eccleshall, or please feel free to contact me and I can provide you with further details – I am happy to post out to you if you are living in the UK. Now my last event for 2017 is behind me, I have no more workshops planned until January and both my December exhibitions are up and running, it is time to take stock and think about what direction to take my jewellery into next year. I will continue knitting my tiaras and crowns, that is a given, along with making wedding jewellery commissions. I am planning a whole series of new jewellery making workshops for the New Year and I am waiting to see the response from my exhibitions before I start knitting and crocheting more wall art. 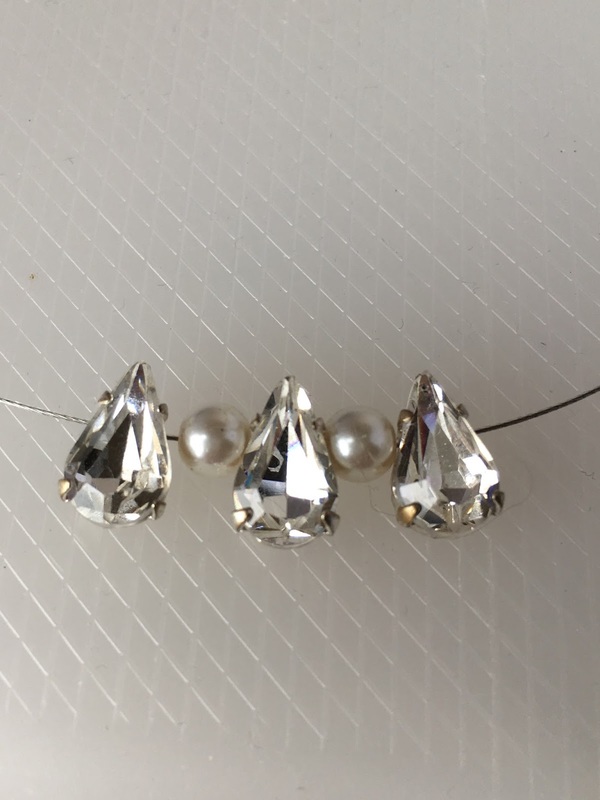 but I am also wanting to introduce a range of beaded birthstone jewellery so I have been looking at the Kernowcraft website to see whether this would be possible – and to my delight I have discovered it is and I thought I would like to show you how! Firstly why am I so surprised at being able to do this? so here is my wish list with links to the product on the Kernowcraft website – If these products capture your imagination please contact me to discuss the type of jewellery I would /could make with the beads as I would be happy to make as a commission. I would hang at least five of these on a crocheted choker style necklace either with beading thread or wire. You can actually buy diamonds as beads – who knew?! I would hope to crochet a choker / necklace and include at least three of these in the design – You just don’t know how excited I am about these! Most Opals come in cabochon form and would look stunning wire wrapped, but to my delight Kernowcraft also have opal beads which would hang so elegantly from a knitted or crocheted choker. All of my chosen beads could also be incorporated into earring designs and some could even be added to a knitted or crocheted ring and I am sure with more thought I could come up with even more suggestions, that is the beauty of jewellery design – the possibilities are endless . I hope you have enjoyed this post as much as I have enjoyed researching it – and maybe one day I will get my hands on some of these and share my actual makes! this post is part of Kernowcraft’s Win Your Wishlist competition. What can you do with your old, much loved tiara? ……. Upcycle it!!! Do you have a tiara stuffed to the back of a drawer or sat in a box on top of your wardrobe hoping for a day when you can wear it again? or are you saving it in the hope that your daughter will want to wear on her wedding day? Last month a lovely young lady, Sally contacted me out of the blue. Sally had a tiara that she loved but was probably never going to wear again and was wondering if I could make jewellery out of it instead! – what a lovely idea . I arranged to meet Sally with her tiara in Gallery at 12, Eccleshall, as I have a large selection of pearl and crystal jewellery there already made up, I could use those pieces as examples when discussing the possibilities and believe me there were plenty of possibilities! It turned out that Sally also wanted to gift some of the items of jewellery to the people who had helped make her wedding day so special, including her Mum – a lovely idea turned into a really fabulous idea!!! Having spent half an hour or so discussing possible jewellery designs Sally left me with the tiara, and while she went off to enjoy a holiday, I set too dismantling the tiara and making up new jewellery. I agreed to keep Sally informed throughout the process – photographing my makes and emailing them to her so she could tell me if she liked each design or if she wanted it tweaking, by the time she returned from her holiday I had all her new jewellery waiting for her. These are some of the photos I took during the making process, some are completed items and some are the suggested designs before tweaking – I could have also made earrings but as Sally doesn’t wear earrings I didn’t make any this time – there were really so many possibilities!